Gebauer Company sponsored 5-year old Faraha Ali Hasan as part of the June 2011 medical brigade to Assiut Children’s Hospital Egypt in partnership with International Children’s Heart Foundation and Gift of Life NEO. 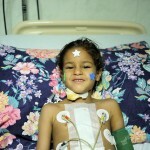 Faraha received an operation on June 10, 2011. She recovered fully and returned home to play with her brother and sister on the farm where her father works. Faraha’s mother says that the local staff, ICHF volunteers, and sponsors are good people, and would like to thank them all for their hard work. This little girl’s life has been saved and her family is so grateful.